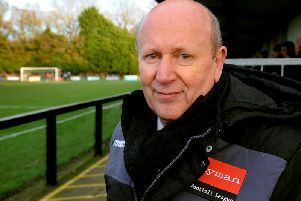 Hurley, along with assistant Matt Langley and former Worthing director Calvin Buckland, took over last week following the departure of Curtis Foster. The former player did not have the best start to his reign, losing to fellow strugglers Arundel 3-0. The result left them joint bottom of the league with Eastbourne United. But Hurley is pleased to be in charge at Middle Road. He said: “I am pleased to have been given the opportunity, I have played at Shoreham previously and live locally so the club always had an appeal to me. “I had spoke earlier in the season with one of the owners about coming in, at that time they chose to go with Curtis. SEE ALSO New Shoreham management team revealed | Arundel beat Shoreham in big relegation battle - picture gallery | Who do Sussex's sides have to face in their battles for promotion and relegation? Hurley revealed he went for another job last summer but they did not match his ambitions. He said: “Shoreham are an ambitious club which should be attractive to anybody wanting to manage. Hurley and his management team are realistic about where things are going this season and knows how he wants his team to play. He said: “With a few days before the deadline and the position we are in, we are realistic with recruitment this season. He added: “We will continue to play with caution this season, two goals in 13 games is unacceptable but we can’t throw caution to the wind and concede easily. Hurley is delighted to have the experienced Buckland on board. He said: “Calvin has a wealth of experience on and off the pitch. Hurley’s task doesn’t get any easier this week when Shoreham host league leaders Chichester City on Saturday. He said: “Realistically we know we are in a tough position, Arundel was a big game and we fell short on the day. “We still have 15 points to play for and whilst mathematically possible we will do everything we can to pinch enough points to survive.